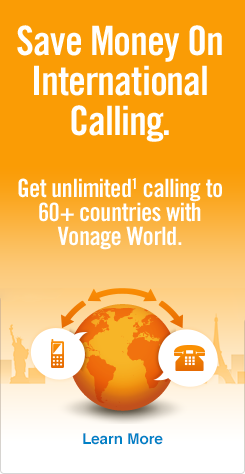 Vonage World Mexico Sin Límites Gives You Unlimited¹ Calls to Mobiles and Landlines in Mexico! You’ve been searching for an affordable way to make unlimited¹ calls to Mexico for ages, especially calls to mobiles. You may have heard of Vonage World®, which allowed for as much calling to Mexico landlines as you wanted. In this mobile day and age, you need a plan for calling Mexico landlines and mobiles, without having to jump through hoops or pay un brazo y una pierna. You’ve tried calling cards for Mexico, but they can be misleading with their minutes. Vonage knows you’ve been looking for free calls to Mexico, so turn your gaze to Vonage World Mexico Sin Límites — Vonage’s newest plan for calling to Mexico! Mexico Sin Límites combines everything you’ve loved about Vonage World with unlimited¹ calls to Mexico mobiles! Unlimited¹ calling to landlines in over 60 countries — including Mexico! Unlimited¹ calling to mobile phones in over 10 countries — Mexico too. Unlimited¹ local and long distance home phone service across the U.S., Canada and Puerto Rico. Vonage Extensions® — extend this calling plan to any phone, even U.S. mobiles, at no extra charge. Vonage World Mexico Sin Límites is like getting free calls to Mexico, meaning you can call Mexico landlines or mobiles seamlessly and affordably. Unlimited¹ calls to Mexico are the basis of this Vonage calling plan, and if you need to brush up on the proper Mexico dialing details, check out how to call Mexico. Still on the fence about our plans? When it comes to domestic and international calls, Vonage has the best value for your dollar, and you can even keep your current phone number for free. And, as stated before, Vonage gives you unlimited¹ calling to Mexico and over 60 other countries, including a number of other Central and South American countries!